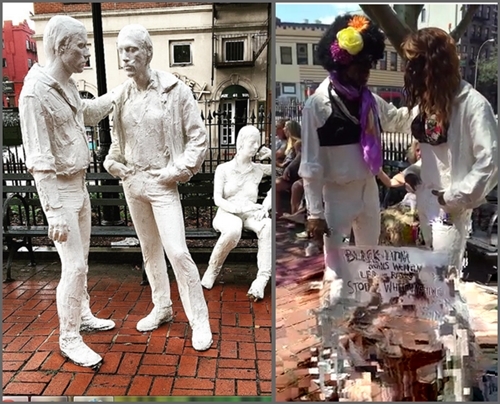 Its being reported that “two queer and gender non-conforming activist women”one Latina and one White have vandalized the iconic gay rights sculpture by George Segal in Sheridan Square Park by painting them brown and black and donning them in wigs because they took the recent comments by Miss Majors a trans-activist who was at the Stonewall and her condemning of the soon to be released movie Stonewall as a “call to action” for trans POC. Disgusting stunt and a slap in the face to EVERYONE in the LGBT community whop fought for these spoiled children freedom.. Attacking art is where I draw the line with these tantrum throwing crazed “activist” wannabes. For their information, Sylvia and Marsha loved those statues and that park and if they were here today they’s slap their faces and read them to shame for this silly and destructive stunt. You do not honor someone by vandalizing. You honor someone by building. But then again I guess its much easier to attack a work of art than it is to raise money on Kickstarter to build a statue honoring Marsha, Sylvia and Stome. I for one personally hope you are caught and prosecuted to the full extent of the law. UPDATE: 8/18/2015: The statues have been restored to their original state. There are times when pilot lights become flaming assholes and this is one of them!! I agree with you Will. This is disgusting. I hate all forms of vandalism including graffiti. It is violent and unnecessary. Imagine the outrage if a white supramicist vandalized the MLK Memorial in D.C.? Hate and destruction is intolerable. These people are no better than the Taliban destroying Buddhist art in Afghanistan. I totally agree with the writer. I knew Sylvia and Marsha fairly well, and I agree that they would strongly disapprove of what’s going on with certain so-called transgender activism. These activists are the ones who are re-writing history.